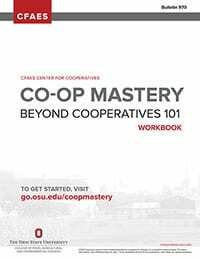 The Co-op Mastery workbook complements Co-op Mastery: Beyond Cooperatives 101, a free online training from the Ohio State University College of Food, Agricultural, and Environmental Sciences Center for Cooperatives, available at www.go.osu.edu/coopmastery. Co-op members, directors, managers, employees, and students of cooperatives can use the workbook individually as a self-paced tool, or as a guided activity to learn about the cooperative business model. The 48-page workbook enhances learning with activities and examples in cooperative principles, governance, legal considerations, taxation, finance, and formation​ planning. Co-op Mastery workbooks, $13 hard copy, $8 PDF, available at the Extension Publications website. Dr. Iryna Demko, formerly an agribusiness researcher with the Department of Agricultural, Environmental, and Development Economics (AEDE) at Ohio State University, has released a report on research she conducted while at OSU about trends of U.S. agricultural cooperatives, showing how the number of agricultural cooperatives in the U.S. has declined while cooperative business volume and number of members has increased. Dr. Demko currently is a research associate at the Center for Economic Development at Cleveland State University. Dr. Demko’s full report, “Trends of U.S. 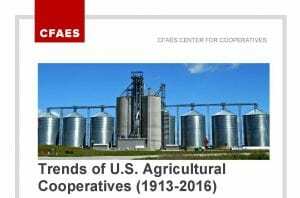 Agricultural Cooperatives: 1913 to 2016,” has been published by the Center for Cooperatives and is now available for viewing on the Center’s webpage. The latest edition of the World Cooperative Monitor report on the world’s largest cooperative and mutual organizations has been released, providing rankings of the Top 300 and sector analysis based on 2016 financial data. 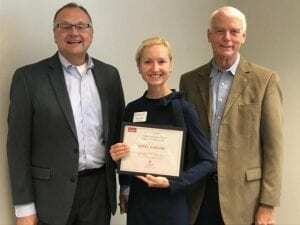 This report has a new feature: an analysis of the Top 300 and the United Nation’s Sustainable Development Goals (SDGs), taking a look at how the largest cooperative enterprises and mutual in the world are moving toward achieving the SDGs. There are many examples of cooperative development of projects to ensure fair labor, protect the environment, and more to meet the SDGs. 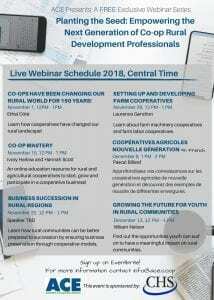 The Association of Cooperative Educators (ACE) presents the 2018 webinar series “Planting the Seed: Empowering the Next Generation of Co-op Rural Development Professionals.” Staff from the CFAES Center for Cooperatives presents the Center’s signature online training, Co-op Mastery, an online education resource for rural and agricultural cooperatives to start, grow and participate in a cooperative business. The free webinar takes place November 15th, from noon to 1 p.m.
A conference connecting healthy food, farms and communities, dedicated to the life and work of Patrick Kaufman. 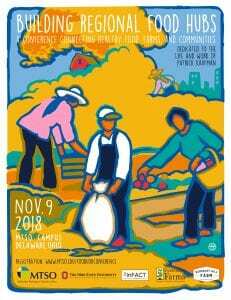 Join us Nov. 9 for a one-day conference to connect practitioners, researchers, activists and others engaged in the development of regional food hubs to network and share best practices. Practitioners and researchers will share the findings of a food hub project aimed at improving food access in Columbus, among other learning opportunities. 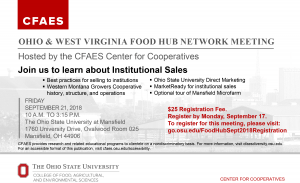 This conference is presented by Methodist Theological School in Ohio, the Initiative for Food and AgriCultural Transformation (InFACT) of The Ohio State University, Franklinton Farms, and Seminary Hill Farm on the campus of MTSO. It is supported in part by a Linkage and Leverage grant through InFACT. The conference will be held from 9 a.m. to 4 p.m. Nov. 9 on the campus of MTSO, 3081 Columbus Pike in Delaware. Here is a Google map. A full schedule for the day will be posted soon.